By Joseph Herron: This morning on ESPN’s “First Take” with Stephen A. Smith and Skip Bayless, HBO’s Larry Merchant chimed in on whether or not a mega fight with Floyd Mayweather Jr. and Manny Pacquiao would ever take place. While many fight fans and boxing scribes have called for a PPV boycott of both fighters’ events to force the hand of the promoters and athletes involved, Mr. Merchant feels the prospect of that actually happening is highly unlikely. 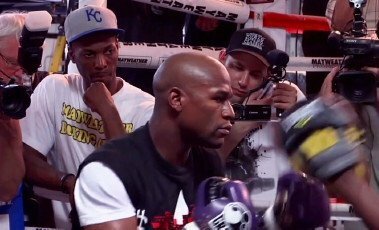 The two antagonizing sports personalities also brought up the lingering question of whether or not Floyd Mayweather Jr. is afraid to fight Manny Pacquiao. Taking into consideration his previous vocal exchanges with the pound for pound champion, the great Larry Merchant gave a somewhat surprising response. Although Larry the legend is able to make sense of the incomprehensible, fight fans, just like any patrons or consumers of any business, don’t want to hear about the economics involved with day to day trade issues. It ruins the product and overall consumer experience. When dining at a restaurant, does any paying customer want to hear the fiscal reasons why the manager or owner of the establishment decided to take their favorite item off of the dinner menu? There’s a very good chance that no one would pay a return visit to that establishment, and the business would eventually lose their clientele…hence the current quandary of boxing. In order for the sweet science to flourish among the mainstream once again, the fighters and promoters must be reminded on a regular basis that the customer is always right. The fight fans ultimately sign the paychecks. It’s going to take a lot more than Larry Merchant paying a visit to ESPN, if the boxing industry hopes to capture the imagination of the sports majority once again.